Urban light rail systems usually operate under d.c. current. Once this current has passed through the vehicle, it will attempt to return to its point of departure. Under ideal circumstances, it will pass through the running rails. Unfortunately, the rails are not always sufficiently insulated with the result that current escapes, travelling through the ground and any underground pipelines on its way back to the sub-station, creating what are called “stray currents”. These currents aggravate corrosion in buried pipelines, at times even causing them to burst. To counter this phenomenon, the EN 50122-2 standard stipulates that urban light rail systems must conduct qualification tests on the conductance of their networks, in other words the insulation between rails and earth. It is in this connection that TSO, RENOFER and ETF called on EURAILTEST’s services during summer 2018. Last June, Eurailtest was commissioned by TSO (Travaux du Sud-Ouest) to perform conductance measurements on a 5.4 km section of tram line under development in Luxembourg. The tests were carried out by the Test and Measurement Laboratory (LEM), which is one of Eurailtest’s partner laboratories. In accordance with the wishes of the client, measurements were conducted in accordance with the EN 50122-2 standard. This enabled the quality of the electrical insulation to be qualified as a whole in relation to the electrical earthing of the individual section parts. Track on the Luxembourg network consists of long welded rails, which means that, to apply the method described in the standard to the letter, the rails would need to be sawn through in several places to comply with test length requirements. LEM has, however, developed an innovative method for conducting the necessary measurements without having to saw the rail. 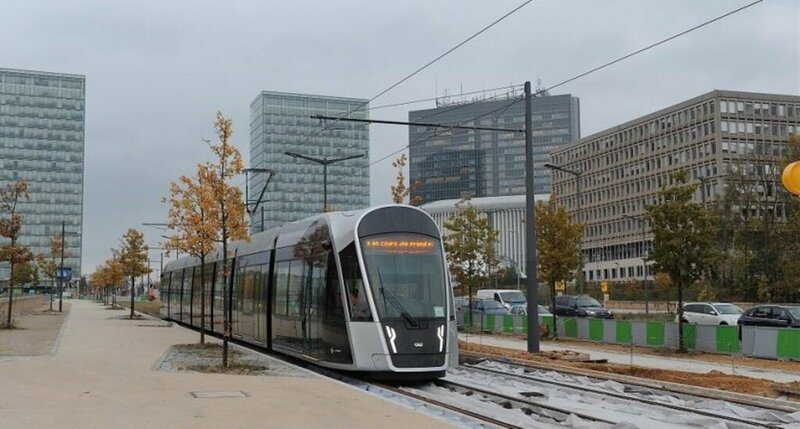 The method involves sending a tram over the line and was put into use in Luxembourg for the first time outside the Greater Paris area. By enabling the rails to be left intact, it offers major economic advantages. A second test campaign still to be conducted to measure the voltage between ground and rail will definitively confirm network compliance with the standard. By the same occasion, TSO, also ordered conductance tests on the tram lines under construction in the Greater Avignon area. These concerned the full length of the line and the vehicle maintenance sheds. The line being still in the construction stage, LEM was able to apply the method set out in Appendix A.3 to EN 50122-2. This consists of injecting d.c. current between the section to be measured and a current injection earth. The current and the resulting rail-to-ground voltage are then measured in accordance with the requirements of the standard. Together with the length of the section measured, these two parameters suffice to establish conductance. As in the case of the Luxembourg network, measurements of the voltage between ground and rail will complete network compliance operations. In July, ETF and RENOFER, also commissioned EURAILTEST to carry out similar measurements on parts of the tram worksites in Rouen. In cooperation with these two clients, the LEM was able to perform all the necessary conductance measurements in a single day for their respective line sections. Here again, the method used was that described in Appendix A.3 to EN 50122-2. On one part of the network, a fault detection procedure was carried out to enable the client to improve conductance in the track. In this case also, it will be possible by measuring the voltage between ground and rail to confirm compliance for the parts of the tram system concerned.